sometimes i think i get so busy looking for the 'ultimate' thing to knit or crochet and i forget that life really is only as complicated as we make it! simple things - simple gifts - are often much more effective and speak volumes in their simplicity... and it is ME that fumbles the ball of yarn and makes a mess out of my intentions! Such frantic searching can lead one to overlook the obvious .. i.e., the granny square. 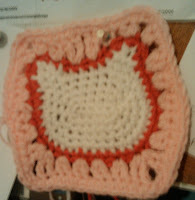 Do i HAVE to make a HUGE afghan in order to pay proper homage to the granny square and make it the 'end-all-be-all' gift? i recently found another option for granny's square .. modified for the children and/or the young at heart .... and while i'm not really sure how the trademark issues would be to sell such gifts, i know that anything i share from my heart to yours has no financial measure to it ... it's Priceless! Go fix a glass of iced tea .... start doing some surfing and before long the sweet and simple summer days will return with plenty of options for making memories that last a lifetime.